It’s that time of year again. It’s the summer season and that means that road construction crews are hitting our streets trying to make the necessary changes and fixes to our roadways before the snowy weather moves in. According to the Massachusetts Department of Transportation (MassDOT), there are dozens of projects that are going on at any given moment around the state. During this time of the year, car accidents and work accidents in Boston and elsewhere are likely, especially when traveling through our state’s roadwork construction zones. According to the Federal Highway Administration, there were nearly 700 fatal accidents in maintenance and construction work zones in 2009. These accidents are likely to happen in the middle of the day, too. About 70 percent of road construction site fatalities between 2003 and 2007 happened between the hours of 8:00 a.m. and 4:59 p.m.
Officials with the State of Massachusetts offer drivers with some safety tips to help them to get through these work zones without the headache of an accident. -Slow down and move over. In the state of Massachusetts, the Move Over Law took place back in March of 2009. This law requires all drivers to move to the next adjacent lane when approaching a stationary maintenance or emergency vehicle that has its flashing lights activated. Drivers who fail to do so run the risk of getting a citation of up to $100. -You should always expect the unexpected in these areas. Speed limits may be changing, lanes of traffic may be changed, workers can be along the road and pedestrians may be instructed to walk on different paths. -Slow it down. Speed is one of the top causes of work zone car accidents. If you speed in these areas, you run the risks of a traffic ticket in double the fine. 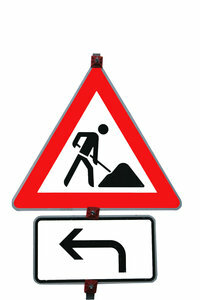 -Be on the lookout for roadside workers when driving through construction areas. -Try to avoid these areas completely if you can. -Always obey flaggers instruction. They are there to help traffic to flow smoothly and safely through the area. -Never tailgate another vehicle in these areas. You always want to make sure that you’re keeping a safe distance between you and the vehicle in front of you. The number one type of traffic accident in these areas are rear-end collisions. -Keep a lookout for signs in these areas. Warning signs are posted in work zones to help you and to help other driver to move safely through work zones. -When heading through a work zone you should expect delays. You want to allow yourself with extra traveling time when you know you have to pass through one of these areas. You can call 511 from your mobile phone to get the most recent traffic conditions. -Keep a good distance from the actual work zone. You want to avoid construction vehicles and workers. -Report any road hazards that you encounter by calling 511. If you have been injured in Massachusetts, call the Law Offices of Jeffrey S. Glassman to schedule a free and confidential consultation to discuss your rights. Call 1-888-367-2900.